Where: (Industrial Tech area of the school). Enter studio through the external (metal) steps on the west side of the school (by the smoke stack). Why: All senior athletes will be presented with the finished figurine at the end of the season banquet. *NO COST* The Wahawk Athletic Booster Club sponsors this activity. 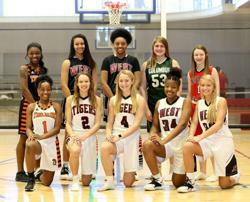 NaTracia Ceaser and Lauren Conrey were named to the 1st Team All Metro Team while Jada Draine and Gabby Moore were named to the 2nd Team. 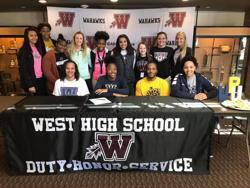 Ceaser, who recently signed to play basketball with William Penn, scored 1,231 career points while contributing across the board for a West team that finished .500 or better her final three seasons. Conrey made the first team for the first time in her career after accumulating 112 assists and 64 steals. Wahawk juniors Isaiah Johnson, Caleb Haag, Dequavion Walker and Jaden Keller earned second-team recognition. 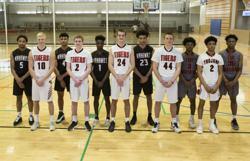 Johnson, Haag and Walker each averaged more than 11 points a game, while Keller was the metro’s top rebounder and also led West in assists and steals. William Penn University is a member of the Heart of America Conference. William Penn is currently 30-2 and advancing to the National Association of Intercollegiate Athletics (NAIA) National Championship Round. Basketball Coaches Association (IBCA) All Region Team. Congratulations to West High's Bowling Coach, Todd Bracken who was recently named the District Coach of the Year!! 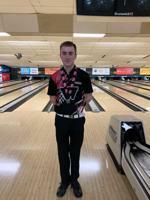 Congratulations to Junior Bowler Tristan Corcoran on his State runner-up finish at the State 3A Bowling Tournament here in Waterloo. In his 2nd game of the day, he had 10 consecutive strikes to make a huge come back and finish with a 277. He finished the tournament with a 483 which allowed him to capture 2nd place. Corcoran’s finish was the highest in school history for a West boys’ bowler. Congrats to Senior Natracia Ceasar for being named 1st Team All MVC! Also congrats to Senior Jada Draine and Junior Lauren Conrey for making the 2nd Team!! Sophomore Gabby Moore and Freshman Brooklynn Smith were named Honorable Mention. Seniors Jada Draine and Meredith Eighmey were named to the All Academic Team. 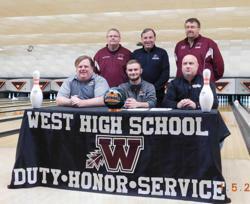 WATERLOO— J.P Richmond, a bowler for West High School, signed his national letter of intent to attend Midland University in Fremont, Nebraska, last Saturday. Midland University is a NAIA school and a member of the Great Plains Athletic Conference. Richmond is a four-time letter winner and was named captain during his junior and senior years. He bowled on the 4th place state finisher in 2017 and helped lead West High School to a 3rd place finish in 2018. In addition, he was a First Team All-Mississippi Valley Conference selection. 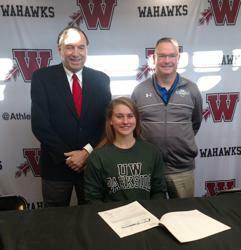 West High School senior Isabella Guyer, a goal keeper, signed her national letter of intent today to play soccer for the University of Wisconsin-Parkside. UW Parkside is a Division II college and is a part of the Great Lakes Intercollegiate Athletic Conference. Guyer is a four-year starter and was named the Mississippi Valley Conference Goal Keeper of the Year in 2016 and 2018. She is a school record holder in several goal keeping categories as she heads into her senior soccer season. She registered seven shutouts in 2018. 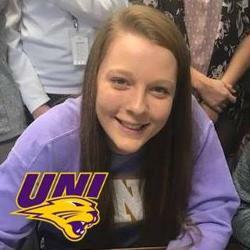 Kaylissa Arndorfer, a 6'2" outside hitter/middle blocker from Waterloo West High School signed her National Letter of Intent today to play volleyball at the University of Northern Iowa. Arndorfer, a four year varsity starter, was a three time All Mississippi Valley All Conference selection-including being named to the first team this season. In addition, she was a three time All Metro pick. She averaged 3.82 kills per game and she led the state in blocks her junior year. 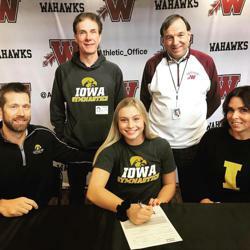 Madelyn Solomon, a gymnast, from Waterloo West High School signed her National Letter of Intent today to become a part of the University of Iowa Gymnastics team. Maddy has competed regionally in gymnastics for the past 12 years. She qualified for the Level Nine National Championships which were held in Spokane, WA, and she was an alternate for the Level Ten National Qualifying Team. During her career at West High, Maddy was also a state qualifier in Swimming and Diving and Track and Field. University of Northern Iowa volleyball recruit Kaylissa Arndorfer of Waterloo West returned to the All Metro first team after averaging 3.82 kills and 1.77 digs per set with 24 total blocks. Her West team secured seven more wins than a season ago before falling to Cedar Falls in the regional final. Waterloo West’s senior setter Christina Campbell and junior outside hitter Lauren Conrey were named to the All Metro second team. The Kentucky Fried Chicken on Kimball Avenue in Waterloo is partnering with West High Athletics. On the second Tuesday of every month, from 5-8 pm, mention West High when ordering, and Kentucky Fried Chicken will donate 10% of their sales to West High Athletics. See below flyer for more information. 2018- 2019 Booster Club Membership Form now available! !